The practice of chiropractic care recognizes that there is a relationship or connection between the body and its structure to your function and health. A chiropractor is a person that not only studies their connection but helps to provide natural, holistic treatment based on the manipulation of your nervous and musculoskeletal system. Chiropractic manipulation is something that we do in our office quite often. We believe that through spinal adjustments and manipulation, treatment and healing can finally begin to occur. Our goal with chiropractic treatments is to restore functions that may have been injured or lost and let people begin to heal naturally, avoiding invasive surgery or any unnecessary medications that would otherwise be warranted. Ready to learn more about our Chiropractic Clinic in Golden Valley, Minnesota? We want to get you back on your feet and feeling like yourself once again. 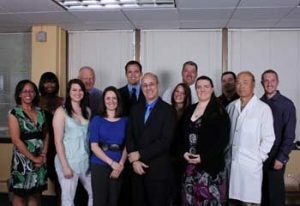 Call Advanced Medical of Twin Cities today and let us show you what we can do for you. For more information about our chiropractic clinic, call today (763) 541-1280.